Even if it looks more like a picture of Uranus. Ah, yeah. Ok. I will show myself to the door now. Fun fact: the original pronounciation of “Uranus” stressed the first syllable and pronounced the “a” with the short “i” sound, but teachers got tired of all the “urine” jokes so they collectively agreed to teach students that it was pronounced differently. That really didn’t work out the way it was supposed to. I go with an older-school “Ouranus” (OO-ranus) pronunciation, which seems the best of several problematic options. So, they took a picture… of… nothing? Technically, it’s the event horizon. But it’s still quite the achievement. Actually, they took a picture of the accretion disk. As objects fall towards a rotating black hole (and virtually all of them rotate; net angular momentum, net electric charge, and total mass are the three quantities retained of the material that falls into them) they accelerate. Accelerate too rapidly, and you start to emit Bremstrahlung, or braking radiation, when you go around a corner. While the event horizon and everything within will be black, there is some radiation from things immediately surrounding it that was emitted in this fashion. The Doppler shift from escaping the black hole is pretty severe, sending what would be X-rays and UV rays into the radio part of the spectrum, but it’s detectable. 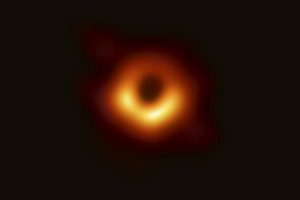 So, they took a picture of the scraps of things that have been consumed by the black hole, not the actual black hole, right? I apologize for my reductionist approach, I do think it’s a great achievement and I am interested to see where it goes, I am just trying to wrap my brain around the idea that we were trying to see something that was famous for being the definition of not being able to be seen. Very close: not “have been consumed” but “are about to be consumed” by the black hole.